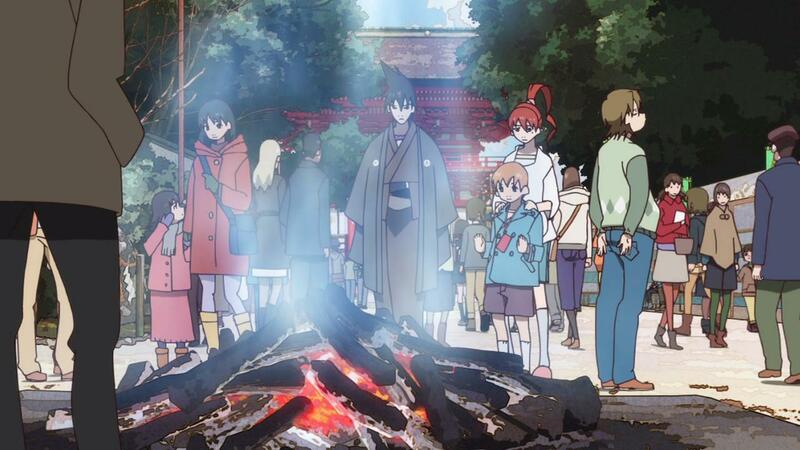 The Ebb and Tide of Seasons; Uchouten Kazoku and its Cycles | Isn't It Electrifying? When I was young, I was often moved from location to location due to my dad’s studies as he tried to do his second round of residencies in a hope to attain a U.S degree for medicine. We traveled from the frosty winters of New Jersey to the brilliant falls of Pennsylvania to the hot and humid Tampa Bay in Florida before comfortably settling in the heart of Houston, Texas, where I’ve stayed for the past 15 years of my life. I don’t really remember much of my time spent in those previous states – all that’s left are the brief hints that old pictures lying in a frame can give me. For the most part, my life has revolved around the general arid climate of Texas; the awfully hot summers, the warm autumns, the chilly winters, and the breezy springs. The climate in Houston doesn’t change much, you see. The lowest we get is perhaps 40 degrees Fahrenheit, and even that is rare. But there are moments where I will walk home from university in the fall, and for a brief moment, I am pulled by the gravity of my own weight and the soft breeze that rustles my oldest memories. Then comes the ache; the inexplicable loneliness and longing for a different weather; for different circumstances. A different life. In these small periods of time I somehow find myself remembering snow and beautiful fall leaves. I don’t really remember the actual memory of spending my days in these sorts of weather, but I feel it nonetheless. It’s a hard emotion to describe, but the most I can put into words is how strong that tug is, as if I’ve been to those places before but just can’t really remember them. But by the time I blink my eyes and try to think about it, the feeling is gone. It passes, and life moves on, as still and fragmented as it was before. 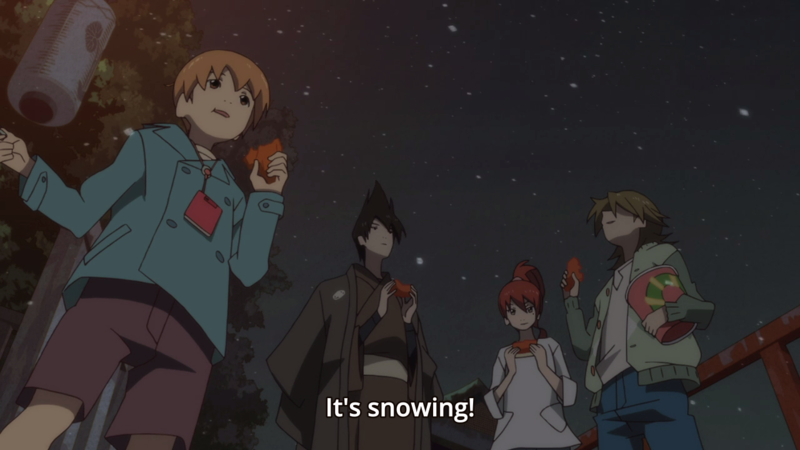 These moments are sparse in real life, but in Uchouten Kazoku there are plenty of them, accompanied by the beauty of the weather. 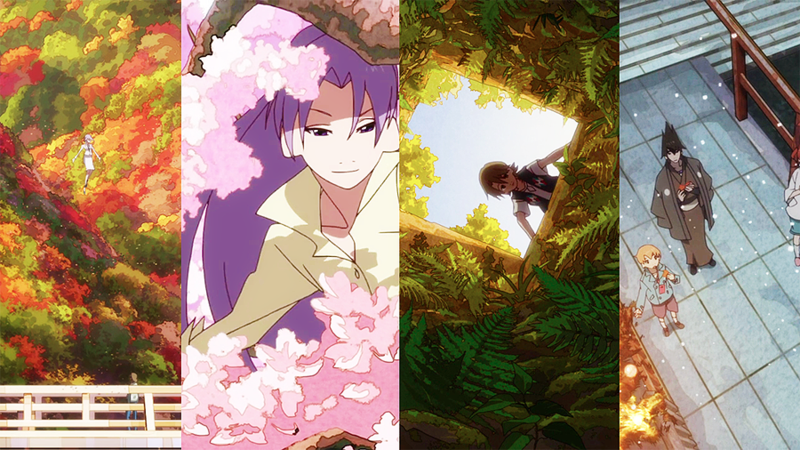 From the detailed backgrounds of welcoming springs, to the cicada-filled hot summers and slowdown of fall and the chills of winter – Uchouten Kazoku treasures every minute, both aesthetically and emotionally. 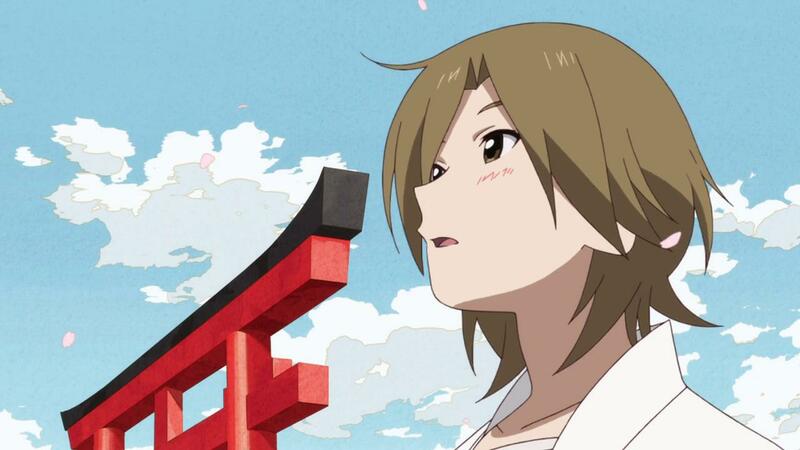 Of course, the theme of seasons and zen isn’t entirely uncommon in anime, but what Uchouten Kazoku does differently is that it uses the climate to aid in the visceral experience of these emotions rather than just symbolize them. 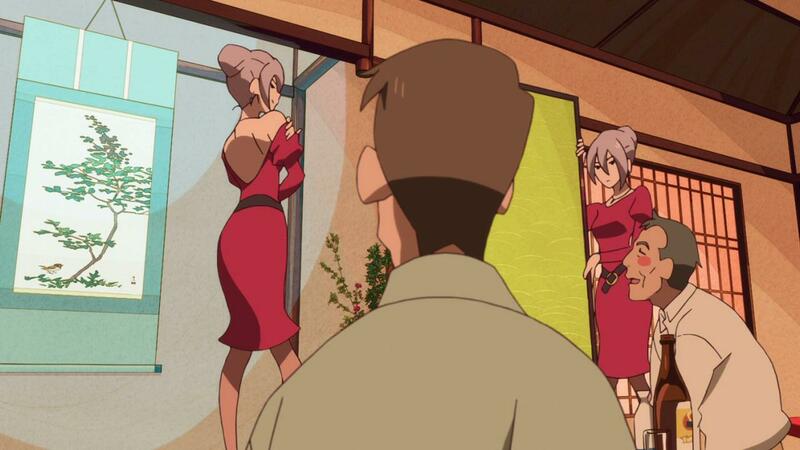 For instance, spring is a season of greetings and youth; it is also the season that marks Benten and Yasaburou’s first meeting. 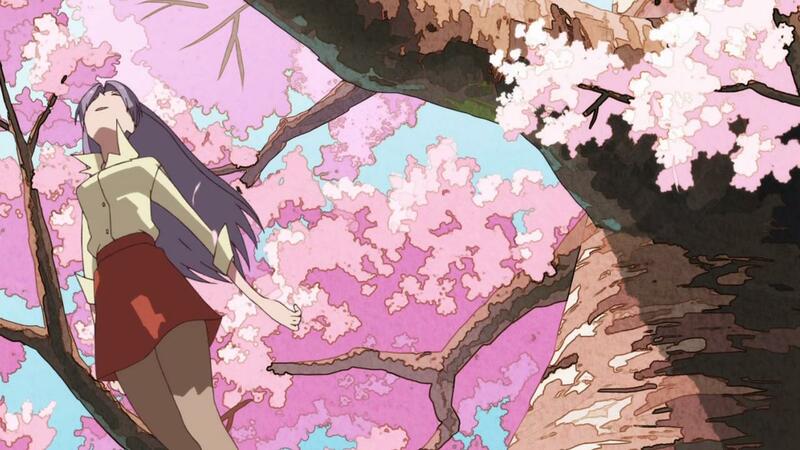 There is a sense of innocence in the way Benten gently floats and twists and turns through the cherry blossom trees. The grace and passion of Benten and Yasaburou’s interaction in these scenes are parallel to the beauty of the blossoms themselves. We, as the audience, resonate strongly with the comfort and grace of spring, and thus it becomes a lot easier to understand and feel the burgeoning youth of these two and their relationship. Continue into summer, and we celebrate the most excitable season with fireworks and parties, as seen with the Ebisugawas and Shimogamos faceoff and Yasaburou’s activites with the Friday Fellows. 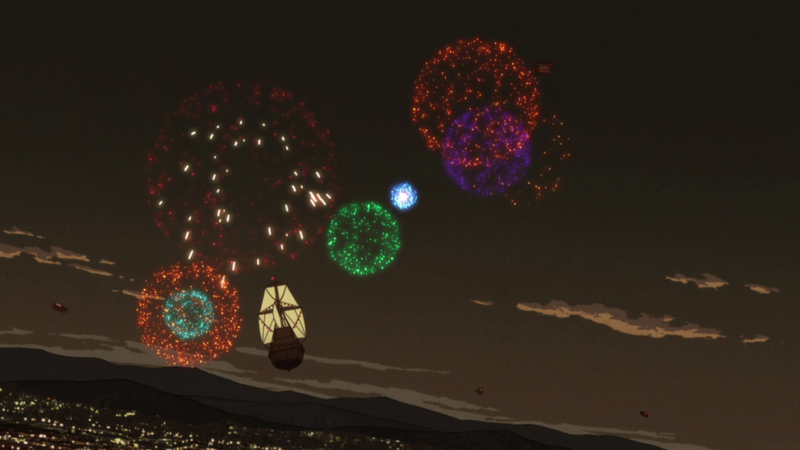 There’s really a vibe of festivity here even though the two episodes celebrate two very different things: the summer festival battle is a light portrayal of the two families’ strained relationship, while Yasaburou’s celebration with Benten and the rest of the Friday Fellows is a surreal party that reveals the disturbing food chain between the humans and tanuki. Ironically, despite the hot blood and hot pots, the atmosphere in these scenes are of ease and fun, rather than of tension and dramatics; this is aided by a warm palette of the oranges, vibrant greens and yellows. Swimming, fireworks and drinks with the sunny and clear sky – Summer is a time of celebration. 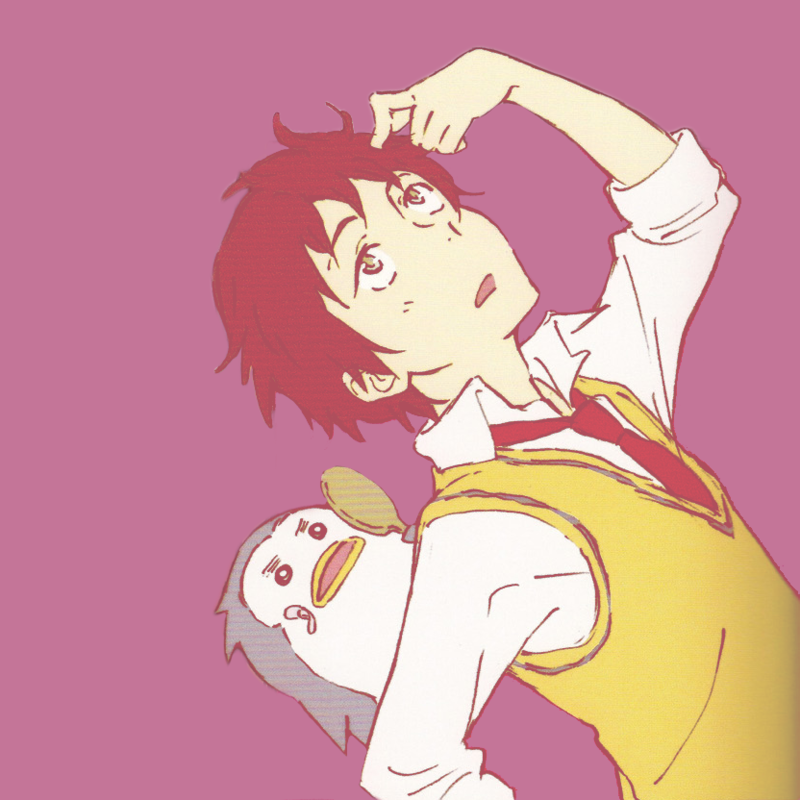 Fall is perhaps Uchouten‘s most memorable and strongest season – one of nostalgia and reminiscence, stranded between long lost desires and loneliness. 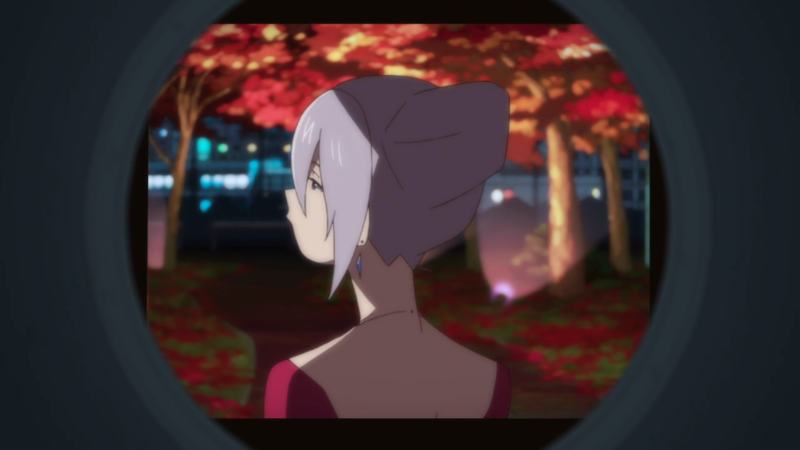 It’s here where most of Benten and Yasaburou’s meetings take place: Benten wishing goodbye in a flurry of fall colors and disappearing in warm smoke on a pleasant evening. 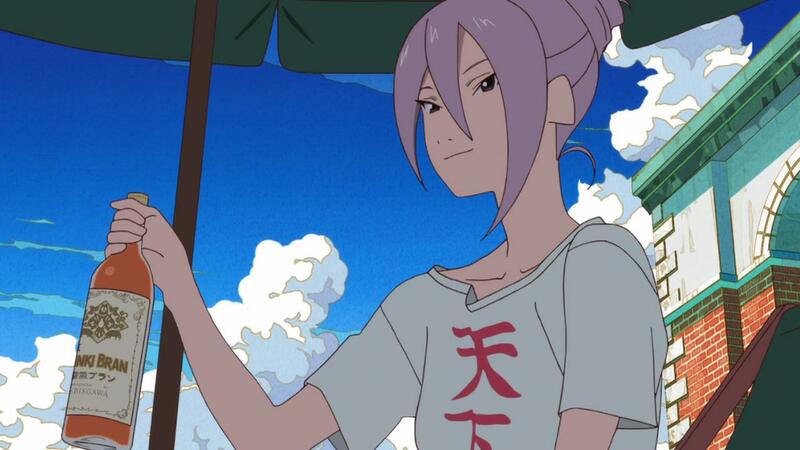 If spring was about the first time Benten and Yasaburou met, then fall is where they stand today – alone, a little broken, and at split ends. Youth here is a disillusion, with the once green leaves turning red and disappearing. 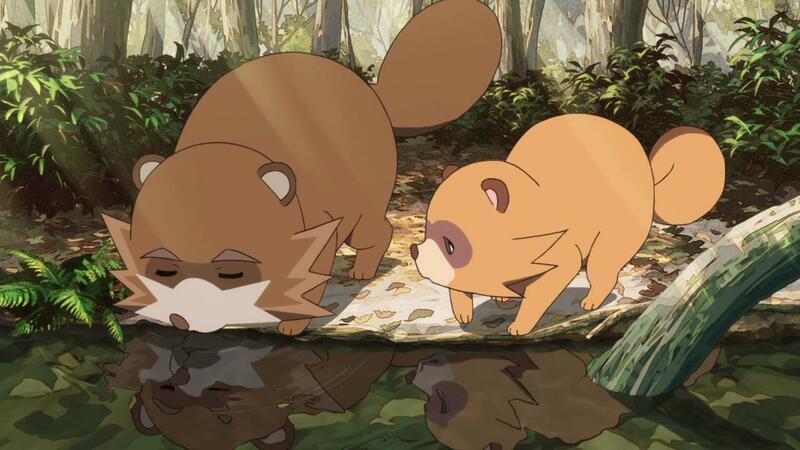 It is also the season where the Shimogamo family confronts their dark tragedy, returning to the foggy, dew-lit morning of their father’s demise. This is followed by winter, which isn’t necessarily as strong or lasting as fall or summer, but still has its beautiful moments: take for instance, a family reunited under a Christmas tree, sharing each other’s warmth in the cold snow, or celebrating New Years by huddling close to the fire in a crowd. Fall is all about the warmest – and loneliest memories we can remember. Of course, there is more than some aesthetic connection between just these beautiful moments and the gorgeous scenery. 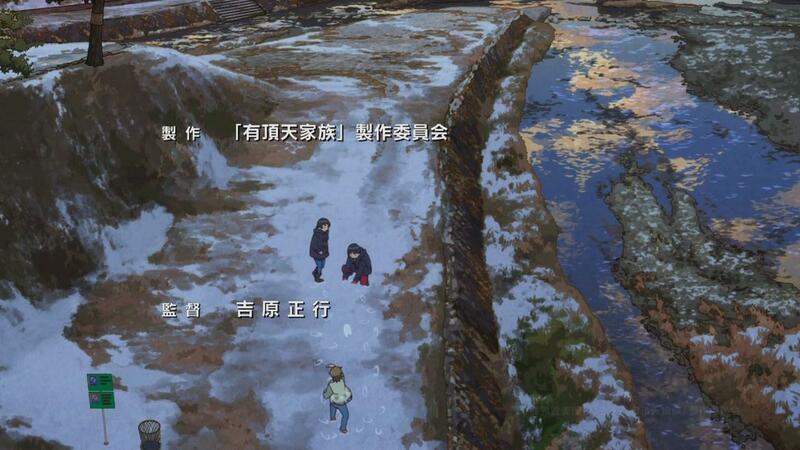 Uchouten at is heart is all about cycles – the cycle of life and death, of food, of emotion and family, and most importantly, the cycles of relationships. It makes perfect sense then, that the cycle of the seasons ties directly into these others. 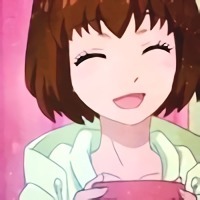 We as human beings transition through so many phases in our lives, and Uchouten marks those changes with the seasons and dialogue. 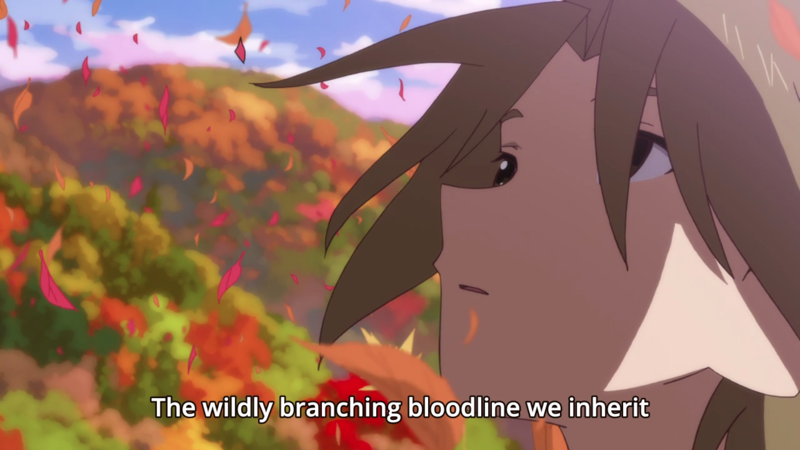 Take for instance, Yasaburou’s conversation with the Professor amongst the small Eden of fall trees – a dialogue that reminds him of how the Friday Fellows are consistently at the top of the pyramid and were even responsible for the death of his father, but are more complex and human than meat-consuming monsters. Had the dialogue taken place in another season altogether, the feeling would have felt very different, but meshing the memorable colors of red and orange with the Professor’s equally warm confession about how people live and die trying to be useful to others and you have a very intimate and heart-to-heart conversation. Yajiro’s confrontation with his brothers could only take place on a solemn and moonlit fall night to emphasize his loneliness and the sorrow he often drowns himself in, figuratively and literally. 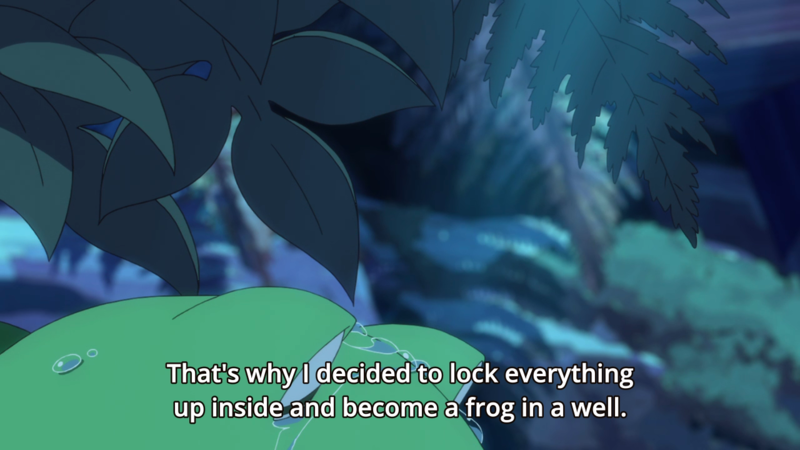 And the betrayal of So’s brother when he confronts the Shimogamo family would not have as much of an effect if it did not occur on a cold and rainy winter night. 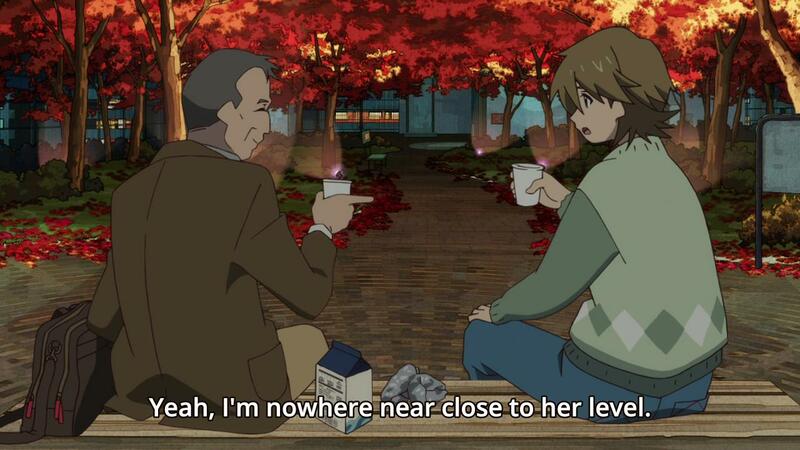 At the end of the day, Uchouten Kazoku is about many things. It is about a disconnected family that reunites through the power of love and belief. It’s about two star crossed lovers, trying to find a meaning in their way of life and each other. But it is mostly about the moments and thoughts that make us pause, look around us, and be overcome by how much we’re alive; that we exist in this world, as fleeting and temporary as it may be. It’s that kind of message that sticks with me as fall arrives this October and I root my own special moments in the genuine and wonderful weather that life shares with me every year – moments I hope to eventually share with the people who matter the most to me too. ← Summer Split #06: Break out of the Cage! I don’t know how you keep doing this, but your writing surprises me every time I load the page. This is a fantastic piece, as poetic as the show itself in its visual splendour. Wonderful work. Keep doing this. Your writing is something to look up to. “But there are moments where I will walk home from university in the fall, and for a brief moment…..” Ah yeah I know that feeling pretty well, I moved around some as a kid as well, sounds like I was older than you since I remember it clearly, and never could quite name what that feeling was, half nostalgia half something else. 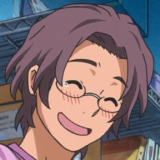 Anyway, I didn’t feel that when I watched the show but I can see why you talked about it since it does kinda work with the over all feeling of the show, slow and remembering something in the past fondly.